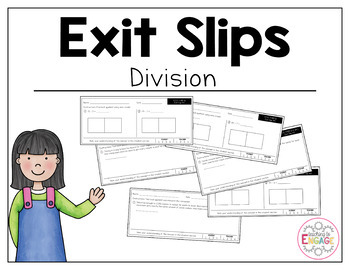 These 27 exit slips were created to help students apply their knowledge of division (4.NBT.6, 4.OA.3). 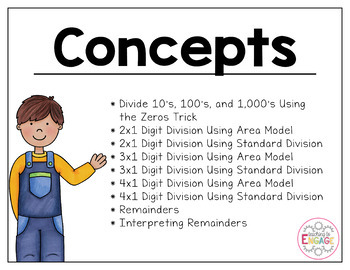 27 Exit Slips: There are three versions of exit slips for each of the ten mathematical concepts. That way you can assess your students' knowledge multiple times. 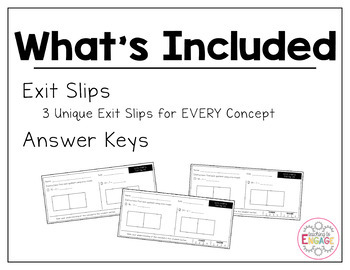 Answer Key: An answer key for each exit slip is included. Teacher Checklist: Also included in this resource are two teacher checklist options for teachers to keep track of their students' progress. Please go to your My Purchases page (you may need to login). Beside each purchase you'll see a Provide Feedback button. Simply click it and you will be taken to a page where you can give a quick rating and leave a short comment for the product. Each time you give feedback, TPT gives you feedback credits that you can use to lower the cost of your future purchases. I value your feedback greatly as it helps me determine which products are the most valuable for your classroom as well as I can improve past, current, and future products.